The European bakery market, with a size of approximately 40 mln ton products, € 210 bln turnover and a forecasted growth of 3.3 % till 2023) will remain one of the most vital bakery markets in the world for the coming years. What are the trends and developments in terms of bakery product demand and innovations? And how is this influencing the operations? In many European countries bakery products are consumed as staple food. The market is well established in terms of product array, distribution channels, regulations, innovation platforms and consumer preferences. However the sector is undergoing significant changes due to increasing health concerns, rising disposable income and high demand for convenient food products. Apart from convenience, European consumers are looking for instant and nutritious food products to help them reducing their calorie and sugar intake, without lessening of taste or pleasure. The most consumed bakery products include biscuits and breads while the demand for other bakery items such as cakes, pastries and cookies are also increasing. Breads and rolls have dominated the baked goods segment, while pizzas have the highest potential growth due to higher demand for frozen as well as chilled pizzas. Germany is the market leader in the European baked products marketswith a growth of 3.0% per year, followed by UK with a growth of 2.9% per year. Increasing tourism drives the growing demand for instant, ready to eat, globally known, low cost and easy to store products such as doughnuts and muffins. As a result the number of low hurdle outlets, such as small kiosks and road side shops, are growing. Reducing food waste and an emphasis on local production are attracting attention in almost all countries. 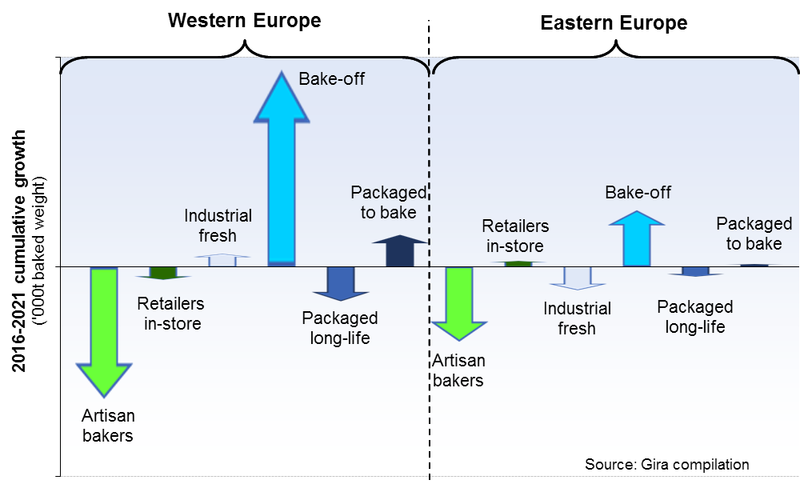 Bakery market-wise, European bakeries are continuously looking for innovations to expand their product portfolio, launching new products and adopt packing-level modifications such as environment friendly packaging, increased shelf lives of baked products, easy to carry and easy to eat products. Bakery operations-wise, bakers are looking for well-made, highly reliable equipment for efficient operations and to reduce the labour input needs. Besides they are looking for equipment that are fairly easy to operate and easy to maintain. They are in need of optimised systems and solutions, comprising of best for purpose unit operations. Optimisation of Capex and Opex is also materialised through the implementation of used bakery equipment, integrated in updated systems and solutions.